Translator and commentator of the Bible; born 1754 at Halle; died at Fürth March 20, 1835; son of Dr. Wolf of Fürth. He was a follower of Moses Mendelssohn; editor (1797) of the periodical "Ha-Meassef" (in which he signed himself or ); and professor at the Königliche Wilhelmsschule at Breslau from 1792 to 1807. He was also one of the founders of the Gesellschaft der Freunde in Berlin (1792). Together with his friend Joel Löwe he edited Mendelssohn's German translation of the Song of Solomon (Berlin, 1788). His translations of Lamentations, Ruth, and Esther were published (Berlin, 1788) with a Hebrew commentary by Joel Löwe and a Hebrew introduction. With Isaac Euchel, Friedländer, and others, he made a translation of the Hafṭarot (ib. 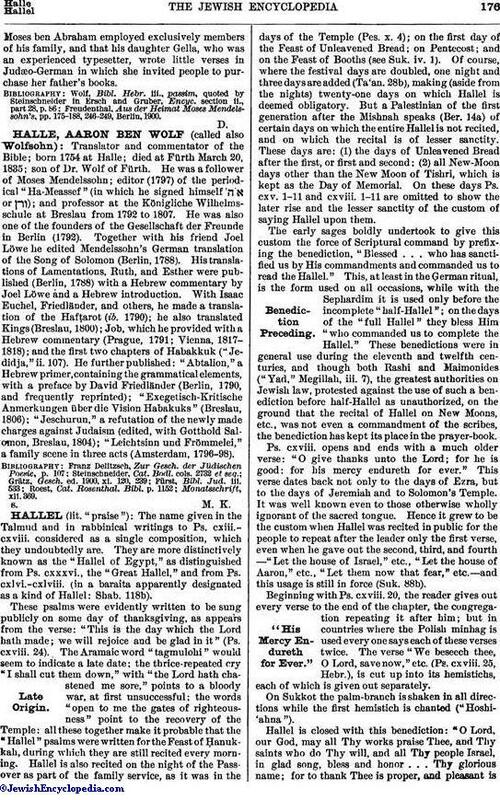 1790); he also translated Kings (Breslau, 1800); Job, which he provided with a Hebrew commentary (Prague, 1791; Vienna, 1817-1818); and the first two chapters of Habakkuk ("Jedidja," ii. 107). He further published: "Abtalion," a Hebrew primer, containing the grammatical elements, with a preface by David Friedländer (Berlin, 1790, and frequently reprinted); "Exegetisch-Kritische Anmerkungen über die Vision Habakuks" (Breslau, 1806); "Jeschurun," a refutation of the newly made charges against Judaism (edited, with Gotthold Salomon, Breslau, 1804); "Leichtsinn und Frömmelei," a family scene in three acts (Amsterdam, 1796-98).